The Poco Premium is our deluxe child carrier. 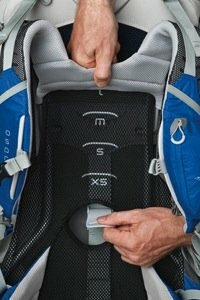 It features a detachable daypack, padded lightweight changing pad, built-in sunshade, size adjustable hipbelt with zippered pockets, a large zippered lower compartment, inner mesh security pocket, two stretch mesh side pockets and a cell phone pocket on the shoulder strap. A built-in changing pad comes in handy for those unexpected pit stops. 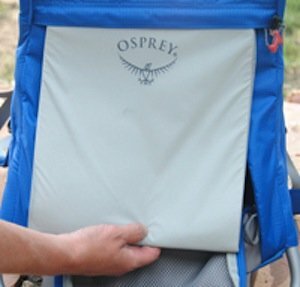 The Poco Premium is Osprey's top-of-the-line child carrier, and offers a host of clever design features to make both parent and child comfortable on those long hikes down the trail or city sidewalk. For Mom and Dad, there's a detachable daypack to stow the necessary gear, size adjustable hip belt with zippered pockets, a large zippered lower compartment, inner mesh security pocket, two stretch mesh side pockets, a cell phone pocket on the shoulder strap, on-the-fly torso sizing adjustment, an ergonomic design, and ample padding to help limit fatigue. Kiddos, meanwhile, will enjoy a built-in sunshade, comfortable and padded seating well, removable drool pad, and padded changing pad. Torso sizing is quickly and easily adjustable on-the-fly. Osprey products include a limited lifetime manufacturer's warranty against defects in materials and workmanship.